I did it, I finally started on my newest scarf. It's the one that Grandma Coco has designed: Papa Bear Sampler Scarf. She has posted step four just this morning. It's not too late to join in the the fun. I have finished the first week and have changed colours for week two. I did make a wee mistake when casting on. I had one stitch too many. Instead of ripping them off and starting again, I waited till I was in row one of the pattern and knit together the last two stiches before the edging. No one will ever know. 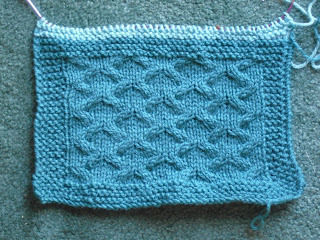 I also added an extra four rows with the new colour. 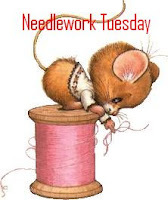 Cheryl recommended using 5mm needles. I chose to use 4.5mm. I bought these cool Harmony wood needles from Knit Pick way back in December but haven't had a chance to use them. I couldn't wait any longer. Love the purple wire. 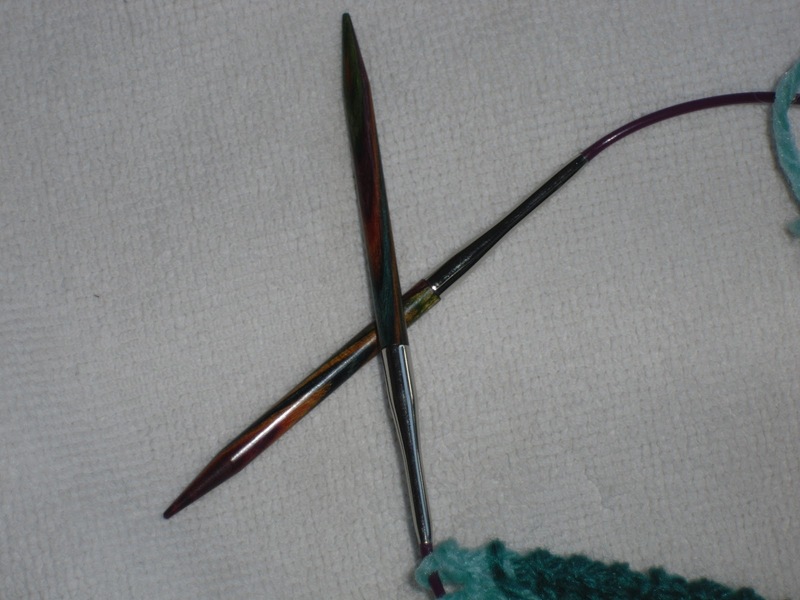 There is a streak in the needle that is the same colour as my darker yarn and I did find that a bit confusing, thinking that I had a snag. Two weeks ago, Rikki featured a cool little basket that she crocheted. I loved it and had to make one. I had a ball of unlabelled cotton sitting upstairs, so I grabbed a hook and set to it. I had the little one done that evening and made the larger one the next day. I gave them to daughter to coral some of her scattered nail polish and such. Thanks Rikki. What have you been up to this week? 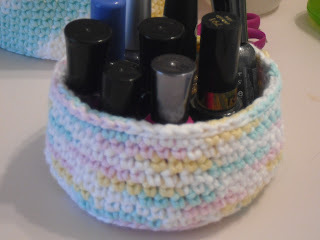 Did you also make some of these little baskets, I'd love to see pictures. My friend Linda, at living, quilting and stuff, has started a new shawl and is using a rich colour of purple. Am looking forward to how the striping will appear. I met Linda several years ago at a quilting retreat and have stayed in touch, though I don't get to visit with her near often enough. Sherrie at Just Books has started a new pineapple doily. Lovely colour, maize, perfect for autumn. 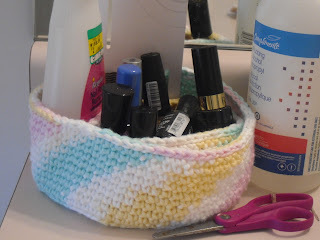 Rikki at Rikki's Teleidoscope has included instructions for how to crochet with wire. Over at Lit and Laundry, Beth shares a few of the projects that she has been working away at. Wonderfully practical as well as very pretty - I love these baskets. I love your scarf!!! Pretty colour and I'm interested to see how the colour changes work. Good idea to add the extra rows of the separator, too. 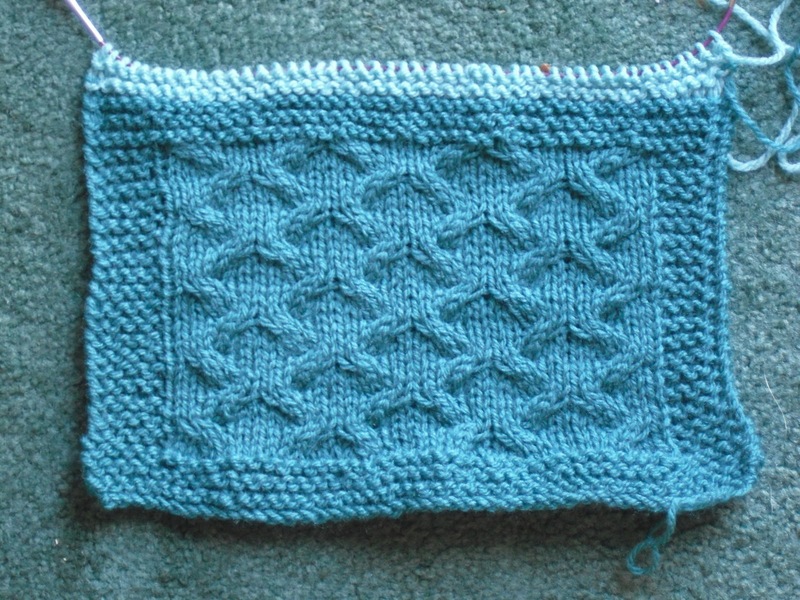 Here's a thought....you're adding a few extra rows with each pattern change so maybe you'll only need 11 different stitch pattern sections to achieve a good length of scarf. I'm happy to see how you 'fudged' the numbers for the extra stitch. Oh, I love the baskets. I am making them all the time now, smaller for rings etc. I have yet to make a bigger one for the bathroom though. I love the colors of yours. I also posted some instructions on the wire necklaces. Those baskets are great! Thanks for the link - definitely going on my list. inlinkz.com has a free linky tool if you're interested. Pretty easy to use. Also, can I steal your cute mouse on a spool button? Thanks! Love pattern in your scarf. I'm so envious of knitters. The things you all make are beautiful. 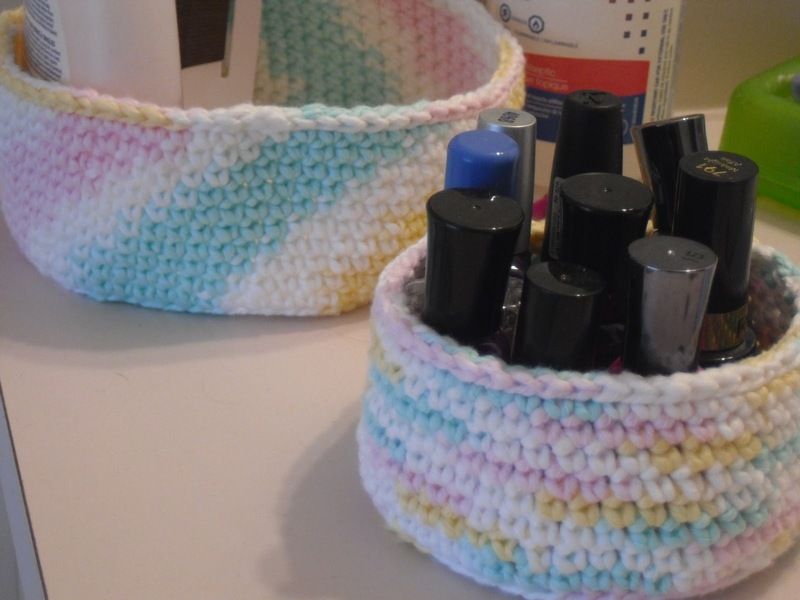 Love those baskets, I'm going to have to make some of those. Thanks for stopping by Just Books. Have a great day! 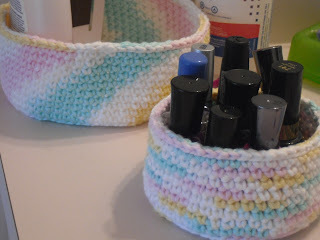 Nice projects, and I really like the look of those Harmony needles!